Today we review the product Super Pump MAX manufactured by Gaspari. Super Pump MAX was specifically designed to help you increase the nitric oxide levels in your body. This product also incorporated ingredients such as vitamins and amino acids that specifically help to better you physically. 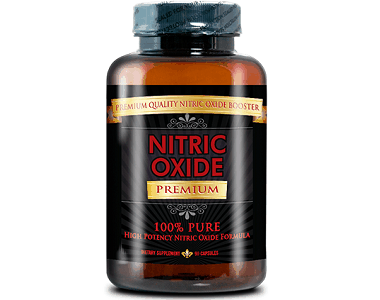 Elevated levels of nitric oxide in the body help your muscles to get the oxygen supply necessary to help you last longer during workouts and to help you build muscle faster. This product also claims to optimize your energy output and to aid in the recovery of your muscles after intense workouts. 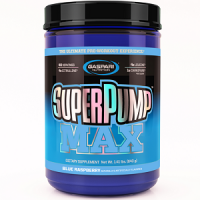 What’s in Gaspari Super Pump MAX? The active and most crucial ingredients in this supplement are L-ornithine and L-citrulline. These two ingredients get converted to nitric oxide which leads to blood vessel dilation and increased blood flow. The vitamins and minerals in the product help with muscle contraction and encourage the body to derive energy from fat storages in the body. Unfortunately, this product does contain some food additives, like Di-Potassium Phosphate and it also does not specify whether this product is vegan and vegetarian-friendly. 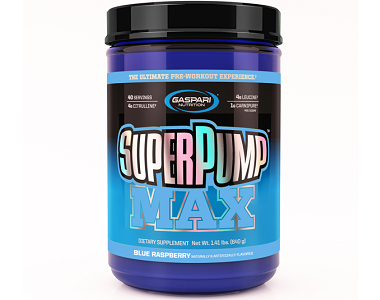 How Do You Use Gaspari Super Pump MAX? It is recommended that you take 1 – 3 scoops of product and mix it with 8 – 24 oz. of cold water or any other fluid 30 – 40 minutes before starting your training session. If it is your first time using this product take only 1 scoop for your first 3 workouts to allow your body to adjust to the various nutrients. Don’t use this supplement when you are not training. If you are pregnant, nursing or you have a serious medical condition it is best to speak to your doctor before taking this supplement. You can order this supplement directly from the manufacturer’s website for $64.99 per bottle. You will qualify for free delivery if your order value is more than $99. There does not appear to be any discounts on bulk purchases or any other first-time customer incentives. After thorough research regarding this product, we could not locate any guarantee. This is quite bothersome as it shows the lack of confidence placed in this product by the manufacturers. Most of the customer reviews regarding this product are quite positive, however, some of the negative reviews state that this product simply does not work, tastes horrible and causes stomach problems. We like that this product incorporates mostly natural ingredients and that it is available at most 3rd party retailers and can be bought directly from the manufacturer. However, the lack of a guarantee raises some alarms regarding the effectiveness of this product. We are also worried about some of the negative reviews on Amazon and the fact that this product is quite expensive if compared to similar supplements on the market.